"How nice" = Que agradable it is to walk barefoot = descalzo at home, on the grass = cesped, or on the soft sand at the beach. But later we have to put on = ponerse some shoes and perhaps socks = calcetines if it´s cold, and our feet sweat = sudan if it´s hot. Poor feet all wrapped up = envueltos. A 2.) poll of 2,000 people for the Society of Chiropodists and Podiatrists found that 3.) footwear, 4.) such as 5.) high heels and even 6.) ill-fitting trainers, could be behind a 7.) surge in cases of osteoarthritis, a condition that causes 8.) pain and 9.) stiffness in the 10.) joints of the foot. Such 11.) research isn't 12.) straightforward – older people are asked how often they 13.) wore high heels in their 20s; I'd find that quite difficult to remember – but I do agree with the 14.) broad thrust. We know that wearing high heels increases the pressure on the 15. ball of the foot, and that this can 16.) lead to foot pain and, possibly, to osteoarthritis. What 17.) most people don't think about, 18.) though, is that shoe 19.) width is as important as the 20.) height of the heel – wearing shoes that are too 21.) narrow can lead to 22.) bunions and 23.) hammer-toes. From around the age of 20, most of us don't even think about changing our shoe 24.) size, but the size of your foot does change – so it's important to keep getting your feet measured. It's important not to wear heels every day: for daily use, choose a shoe with a 25.) round toe and a heel of less than an inch. For a special occasion, wear a round-toe and a 26.) wedge heel: this places less pressure on the ball of the foot. Also make sure you choose the right style of trainer for the activity you're doing: wearing the 27.) wrong sort can cause 28.) injury and increase the stress placed on joints.29.) Lace-up running shoes provide the best 30.) support: it's best to wear those if you have a manual job, or even for a walk in the park. The 31.) key issue is fit: be sure to 32.) choose shoes that are comfortable, and you'll be well on the way to helping prevent osteoarthritis. Podiatrist Jill Halstead is a spokeswoman for the charity Arthritis Research UK; arthritisresearchuk.org. "Imagine living in a shoe"! 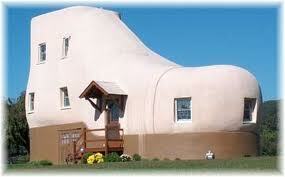 The Haines Shoe House is a shoe-shaped house in Hallam, Pennsylvania, along the Lincoln Highway. It was built in 1948 by shoe salesman Mahlon Haines as a form of advertisement. The house, which is 25 feet tall and contains five stories = plantas, was once rented out to couples = parejas, and is now open for public tours. It is located on Shoe House Road. The enterior has three bedrooms, a kitchen, two bathrooms and a living room. TheShoe House is located at 197 Shoe House Road near the Hellam exit of U.S. 30. Take PA . 462 east off of I-83 to the town of Hellam. Turn north (left) off of Rt. 462 on to Shoe House Road. Elvis singing " Blue suede shoes? you present. It's awesome to come across a blog every once in a while that isn't the same unwanted rehashed material. subject, it might not be a taboo subject but usually folks don't talk about these issues. To the next! Best wishes!! I've read several good stuff here. Certainly worth bookmarking for revisiting. I surprise how a lot attempt you place to create this type of great informative website. I.E., it's got some overlapping issues. I simply wanted to provide you with a quick heads up! Aside from that, excellent blog! of know-how, thus it's fastidious to read this web site, and I used to pay a visit this web site all the time. to start my own blog soon but I'm having a tough time deciding between BlogEngine/Wordpress/B2evolution and Drupal. The reason I ask is because your layout seems different then most blogs and I'm looking for something unique.